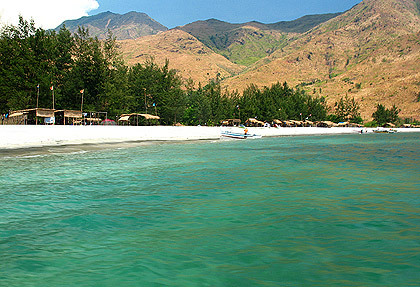 If you enjoyed what Anawangin Cove in San Antonio, Zambales has to offer we’re sure you will find this haven even better. Nagsasa Cove is similar to Anawangin but it’s bigger and more pristine. It’s also less crowded for the moment. Leo visited Nagsasa just this summer (2010). Virtually unknown until around two years ago, Nagsasa has been a place of retreat for travelers who try to avoid the crowds in Anawangin especially on weekends. Even that may soon change as Leo noticed a line of tables and huts on the southern end of the beach where it had been bare not more than two years ago – and a pretty good number of visitors. There used to be a small Aeta settlement here but it has now grown into a campsite. Still Nagsasa is more tranquil and relatively untouched compared to Anawangin. A favorite of photographers, Nagsasa is another must-visit place for the shoestring traveler. It’s hard not to spot a group of photographers at work around the long stretch of grayish-white beach, the wide and shallow creek at the back of the cove or the valley farther back. It takes an hour by boat to reach Nagsasa from the fishing village of Pundaquit, Zambales the normal jump-off point for boats traveling to the cove (assuming the seas are relatively calm). That’s about 30 minutes from Anawangin if you’re doing both destinations in one trip. It’s also possible to do an 8-hour trek all the way from Pundaquit. The first things Leo noticed as the boat inched its way towards Nagsasa’s shores were the jade-green waters and the long stretch of grayish white volcanic sand. And then there is the by-now familiar cluster of evergreen trees that line a good stretch of the beach. It’s Anawangin all over again but grander and more scenic. The waters around the cove are a brighter shade of turquoise compared to the former. 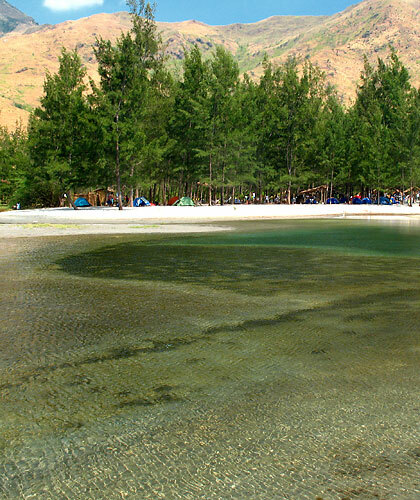 The beach is almost devoid of corals and rocks but the waters are not deep and look ideal for swimming. 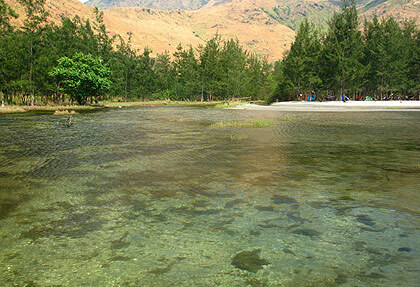 According to the boat guide and locals parrot fishes can be seen in these waters. Indeed there was a group of folks spear-fishing not very far from the shore. There is a wide and shallow creek just at the back of the cove that drains out into the sea with evergreen trees lining its banks. The creek is an unforgettable picture of serenity. It is shallow enough and so clear one can easily make out several fishes that were apparently trapped by the low tide. While crossing this creek at the spot where it empties into the sea, Leo suddenly sank to his knees at his right foot. Struggling to extricate himself from the quagmire, he initially feared he had stepped into quicksand. Eventually he was able to free his right foot but when he lifted it his slipper was gone! Only then did he remember that this was not typical sand from corals but volcanic material from Mt. Pinatubo and no different from the lahar that devastated villages in Pampanga and Tarlac every time it rained heavily in those areas where lahar was deposited. That volcanic sand at the mouth of the creek is really soft and loose. A creek lined by evergreen trees making its way to the sea. Nagsasa Cove. Beyond the creek and cluster of evergreens is a valley framed by a group of rolling hills. Even during the hot summer the valley scenery was something to behold. One friend remarked that it certainly did not look like the Philippines. We could hardly believe it when we read from a blog that the area had been used for target practice by US Air Force bombers based at Clark Air Base several years back. 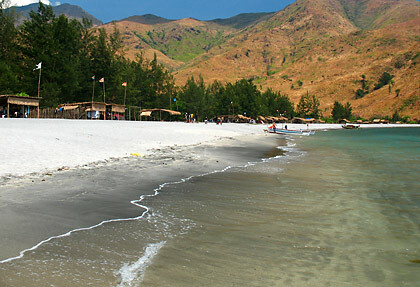 Huts have now appeared on the sandy beach area in Nagsasa Cove. While interacting with the locals back at the campsite, Leo learned that, just like at Anawangin, the sand and evergreen trees were absent before Mt. Pinatubo erupted in 1991. The shoreline was closer to the line of hills behind the present cove. Some enterprising locals have settled here besides the Aetas and seemed intent on developing the place for tourism, albeit not on a grand commercial scale and at rates still affordable for the shoestring traveler. It would really be nice if they can do it along the lines of eco-tourism, preserving the beauty of the place in the process. 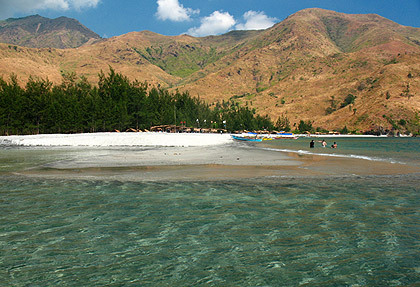 For now Nagsasa is the tranquil and laid-back alternative to Anawangin Cove. Let’s hope and pray it stays that way for years to come.